GARY Taylor-Fletcher has handed Blackpool a huge boost ahead of tonight’s trip to Hull City. The striker trained yesterday and is part of the travelling squad after shaking off a back injury which kept him out on Saturday’s defeat at Cardiff. Ian Holloway said after Saturday’s game he didn’t expect either Taylor-Fletcher or Tom Ince to be fit enough for the KC Stadium. And while Ince hasn’t travelled, the Pool boss thinks it’s a big boost to have Taylor-Fletcher back in contention. Holloway said: “I’ve named Fletch in my squad. He trained yesterday morning and we’ll see today if there’s been any reaction to the session. It’s hard to tell if he’ll be fit, though. “Fletch is a big part of our football club. He’s been here a long time. He knows how it works and he appreciates it. “He knows the way I want to play and can play in four of five positions. “He’s totally and utterly reliable and there’s no doubt he was missed on Saturday. “Fletch wanted to give it a go in training yesterday and felt fit enough to travel with us today. Ince picked up a hip injury in training and had a scan over the weekend. And while he has missed tonight’s trip, the England U21 star could be back in contention for Charlton’s visit to Bloomfield Road on Saturday. A 22-man Pool squad travelled to Hull this morning, hoping for three points which could in theory move them to the top of the table. 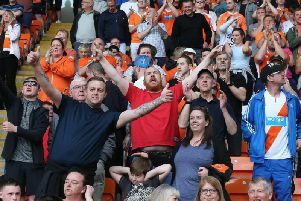 The Seasiders are hoping to bounce back from two defeats and Holloway is expected to make a number of changes tonight, with Neal Eardley, Barry Ferguson, Tiago Gomes and Isaiah Osbourne all expected to return to the starting line-up. Kirk Broadfoot has an ankle injury and hasn’t travelled, neither has with Craig Cathcart, who is still recovering from a torn calf. And Holloway think’s it’s a perfect chance to bounce back. “The quick turnaround has been perfect as tonight gives us a chance to get a good result and put the last two games behind us,” he said. “We’ve had these slip-ups before but we have to forget about all that and focus on tonight. We have to try to create chances and score goals. “I’m very grateful to be at Blackpool and have this job, I’m loving it. No matter what happened in the last two games, I’m still loving it.